The 10 sickened passengers hospitalized after landing at JFK Airport turned out to have the flu. Adam Kuperstein reports. The mystery illness that sickened at least 19 people on a plane from Dubai to John F. Kennedy Airport Wednesday has been confirmed as the flu in at least 10 cases, the mayor's office said Thursday. All 10 patients hospitalized after the nightmare flight will be kept in Jamaica Hospital as a precaution, New York City Mayor press secretary Eric Phillips said on Twitter. The health department added, "The tests showed no illness beyond influenza or other common cold viruses, and we expect all 10 people to be released from the hospital soon." A health official says the incident is a good reminder that flu season is approaching, and it's a good time to get vaccinated. Emirates Flight 203 from Dubai was quarantined on the runway for hours Wednesday after 106 of the 521 passengers on board the flight reported feeling ill. The vast majority of the symptomatic passengers was cleared of illness and allowed to continue on the remaining legs of their trips. Because the Emirates flight is so long, it's possible that there was ongoing flu transmission on it, according to Dr. Oxiris Barbot, acting health commissioner. That specific scenario rarely happens, but the flu -- which can take one to three days to incubate -- does spread easily. "When people fly internationally, we think of bad things -- we thinks or MERS or SARS but ultimately flu virus is one of the most common viruses to contract," said Dr. Rob Glatter, an ER physician at Lenox Hill Hospital. The CDC said passengers who are not ill would be allowed to continue with their travel plans. They advise anyone who got treated and released to see a doctor if they develop symptoms in the coming days. Sykes became so concerned by the situation that she asked a flight attendant for a mask before the flight took off, she said. The attendant, however, said there weren’t any on board. “I proceeded to put my jacket and the blanket over my head for the entirety of the flight because so many people were coughing, and so dramatically,” she said, adding that some passengers were sick to their stomachs. 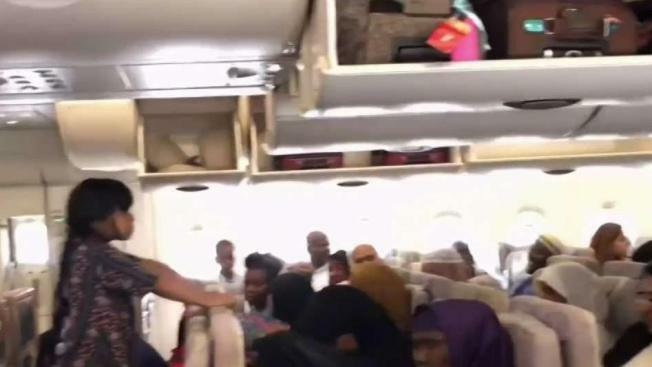 Passenger Hadi Nadimi recalled, "The gentleman sitting next to me said that he said he saw a lot of people, before we sat in the plane, lot of people were coughing and people were like spitting into napkins and stuff. So it was iffy from the get-go." After landing, rapper Vanilla Ice confirmed he was also on the flight. He was not sickened. "My first question is, if it is a virus, why did they let them on the plane?" said passenger Srinivasa Rao. "I sat with them for 13 hours. If it is a virus, we are all breathing the same [air]." Emirates did not respond directly to a request for comment, but the Department of Transportation regulations state that carriers "cannot limit access to transportation on the basis that a passenger has a communicable disease or other medical condition, unless it is determined that the passenger's condition poses a direct threat." Washing your hands is "one of the most important public health measures you can do on an airplane," Glatter said. "The other is wiping down tray tables and armrests. These communal spaces are highly at risk for having the flu." He also recommends avoiding the aisle seat while flying, using nasal saline and trying to avoid alcohol and caffeine because they weaken the immune system.